The SCI Aluminum Stringer 7.5" (190.5 mm) has become the most widely accepted Aluminum Stringer in North America and abroad. Used as the primary member for hand set slab forming systems, its high strength allows larger spacing between the vertical falsework equipment (Frame shoring and/or steel post shores). 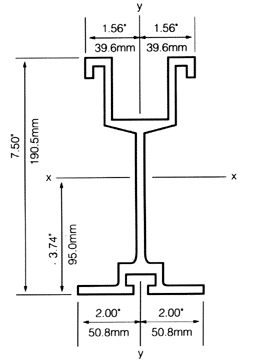 The 4" wide (101.6 mm) base flange is a key feature when erecting the Aluminum Stringers, as they will easily overlap or bypass each other within the 8" (nominal) (203.2 mm) wide U-Heads, thus eliminating very costly field adjustments caused by the interference of walls, beams or columns, etc. The SCI Aluminum Stringer may also be used with SCI's Heavy (9"/228.6 mm) Aluminum Strongback or SCI's Super (12'/304.8 mm) Aluminum Strongback, providing a high strength, lightweight aluminum gang forming system, when high rate of concrete placement, for tie restrictions, cantilever wall forming, ect. is required. The wood nailer and bolt slot allow the same benefits as the Aluminum Joist as you will see in the diagrams shown below. If you have any questions as to which Stingers would best suit your particular requirements, please contact us for more assistance.